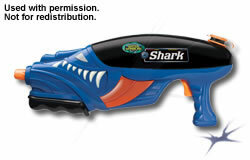 For 2008, Buzz Bee Toys Inc. makes no major changes, per se, to its line, but rather refines its line-up while experimenting with some new additions that may eventually evolve into more ambitious products in the future. 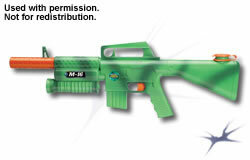 For now, while the general water blaster market still remains an uncertain realm, the Water Warriors line greets 2008 with a lot of returning solid performers and some new item concepts as well. The Water Warriors Orca returns in 2008 with some tweaked colours and, most notably, a moved reservoir refill cap now sitting in a more typical position at the top of the tank (as opposed to the bottom). This move should now prevent the Orca from making bubbling/burbling "whale" noises as air enters the reservoir during pumping. The Water Warriors Jet is the baby brother of the Water Warriors Tarantula. 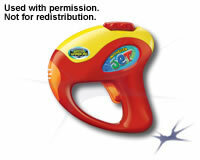 Though its exact dimensions are not known at this time, it is likely similar in size to a Super Soaker XP215. 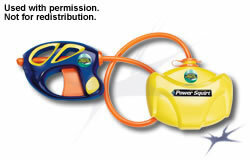 However, like the Water Warriors Tarantula, this little guy is motorized and does not require user pumping. 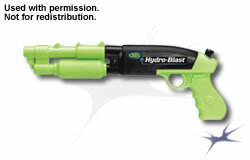 The most numerous new blaster designs for the 2008 Water Warriors line are piston-based blasters. 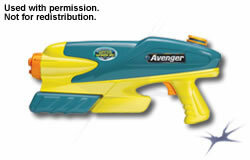 Interesting, Buzz Bee Toys Inc. appears to be testing the market with more realistic-styled water blasters. 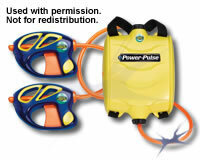 There are also a number of backpack/pack reservoir based blasters in this year's line as well. 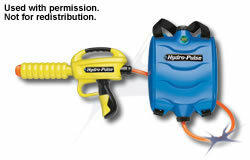 Here, we look forward to eventual hands-on experience with as many of these new water blasters as we can get access to. 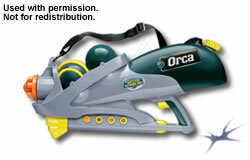 Look forward to new reviews once these new models begin to hit store shelves!